Great Projects!! I am off to check out all the blogs!! Des créations toutes plus belles les unes que les autres. Bravo! I really love the soft subtle backgrounds from the Magenta design team. They inspire my stamping urge. 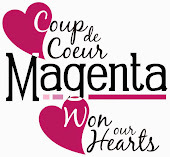 Looking forward to this week of collaboration between Imagine Crafts and Magenta! Off to check out the details on the blogs to read how these lovely cards were made! Beautiful projects! I am going on the blog hop now! Looking forward to it! Great day one!!!!! very awesome project and talent! see you tomorrow. I am so glad that you and Imagine Crafts have teamed up!! I know there are going to be tons of amazing creations to drool over along the way. GORGEOUS projects for day-1, LOVE the colors, textures & designs and really appreciate the tutorials shared along the way!!! Wow, awesome first day! I love that canvas and all of the magenta products used, wow! So many good ideas to combine the inks and the stamps. Great collaboration between companies. I enjoyed visiting all of the blogs! Thanks for sharing everyone.